This was one of those odd weeks when my pile of picture books failed to wow me. I read book after book thinking, “meh” – not what you want in a perfect picture book! I’m always a little depressed when this happens. I wonder if I’m missing something, since clearly a whole team of people thought these books were great enough to publish. But whatever the reason, there was no perfect picture book in this week’s collection, so instead of one of the newer titles from my pile of meh, I went with an older title from my bookshelf (signed to my daughter by Michael Garland :)) a book I have loved for years. I hope you’ll enjoy it! 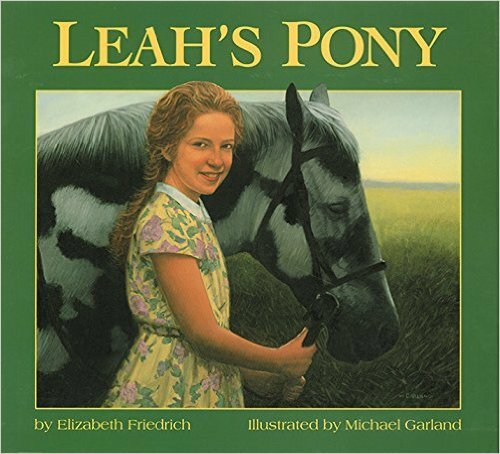 Brief Synopsis: Leah’s pony was swift and strong. She loved him dearly, and together they raced across the fields under summer skies. But then came a year when the corn didn’t grow, locusts blackened the sky, and the earth turned to dust, the beginning of the great drought (the Dust Bowl of the 1930s.) Leah’s family is faced with losing their farm and their livelihood. It takes Leah’s strength and courage to save them. Why I Like This Book: This is historical fiction at its best, bringing a slice of history to life in a way that is not only accessible but irresistible for young readers. The story is simply told with all the right details, and so emotionally compelling I dare anyone not to get choked up at the end! Michael Garland’s art is absolutely stunning and a perfect fit for the story. With slightly longer text as well as the historical context, this is a wonderful choice for older picture book readers. Have a wonderful long weekend, everyone, and Happy Columbus Day! I’m hoping to post the guidelines for the Halloweensie Contest…soon-ish…so stay tuned!! !